Fortune Telling is the practice of predicting information about a person's life as a profession since humankind continues to be curious about its future. If people knew how many people, especially the very rich and powerful ones, went to fortune telling, their jaws would drop through the floor. People came to Great Master Qi for fortune telling because of their desires to better prepare for the future. The following metaphor describes what fortune telling can do for you: If it is raining outside, Great Master Qi will let you know beforehand and give you an umbrella. You will not get soaked like a drowned rat. 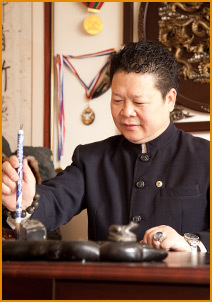 Great Master Qi uses I Ching to predict future. The I Ching (Classic of Changes or Book of Changes), also known as the Yi Jing, is one of the Five Classics, the fundamental books of Confucianism. It is over 3000 years old (the symbols used in divination are over 5000 years old), making it both one of the oldest surviving books in the world, and one of the oldest forms of divination. It is by far the most popular spiritual resource and oracle in Asia, and has a growing following in Europe and the Americas based on its uncanny ability to provide detailed insights to those who study it carefully. 1. I ran into Ms. Chen, an old friend of mine recently. She looked depressed. From our conversation, I knew her three fishes died recently. I predicted there might be some disasters in her life, but I did not want to scare her. I gave her a talisman and asked her to carry it with her. She was in a car accident on the highway the next day and her car collided with a truck. Fortunately her car just had two broken windows and she was safe and sound. She was scared and came to my office. She thanked me for the amulet because she knew it was the amulet that saved her life. 2. When Mr. Tsang came to visit me three months ago, he looked very sick and I told him to pay attention to his health, especially the health of his liver and gallbladder but he did not care. After one month, he could not get up from the bed because of the pain from his belly. After examination, the diagnosis was gallstone and a surgery was needed. He was frightened and came to me. After six Qigong Detoxification treatments, the gallstone was broken into small pieces and some of them were gone. His doctor was amazed by the result. He appreciated my reminder and he did not need a surgery after my treatments. 3. Mr. Feng has his own business. Because of recommendation from bad friends, he bought fake goods and lost all his money. He came to me for suggestions. I realized that he had some bad luck at that moment n his life but I have seen some lucky signs. I gave him an amulet and asked him to go to the casino to try his luck. I warned him that he can not be greedy and should leave after winning some money. The next day he came to my house and thanked me for helping him out. Through these forecast and actions that were taken after forecast, the good luck was brought into their lives. Great Master Qi help them get rid of bad luck. Being safe and sound is a blessing.